Preheat the oven to 350°. Beat all ingredients for sponge cake at low speed with an electric mixer 30 seconds or just until moistened. Pour the batter into buttered and floured 9-inch round cake pan. Bake for 15 to 20 minutes or until a wooden pick inserted in center comes out clean. Cool in pan on wire racks. In the mean time, make syrup. In a small bowl, combine 2 tablespoons of sugar and 2 tablespoons of water. Heat in a microwave until sugar is dissolved. Make filling. In a bowl, beat cream cheese and add condensed milk. Mix well. Add hipping cream and mix well until well blended. Then add chopped strawberries. Mix well. When the cake has cooled, cut the cake into three slices crosswise. Then cut the one of sliced cake into four. Spread the syrup on each cake sheet. Line inside of the 4 QT bowl with plastic wrap. Put one of round cake per sheet on the bottom. Then place four sliced cake sheets along the side of the bowl. Pour the filling into the cake bowl. Place the rest of the cake sheet on top, cover with plastic wrap and chill in the refrigerator for 1 hour. Turn the bowl up side down on the plate. Remove plastic wrap. Spread whipped cream over the cake. 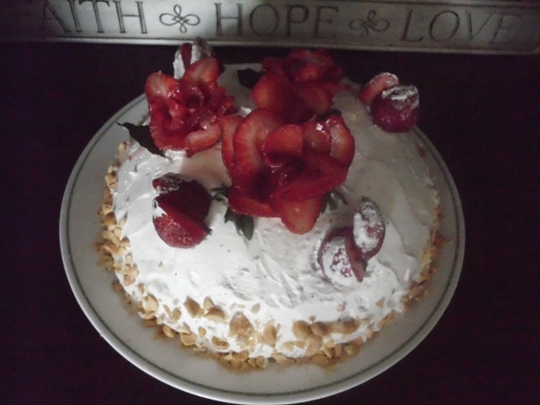 Place cut strawberries on the cake. Sprinkle powder sugar over the strawberries. Put chopped almond on the side of the cake.